We have all the Ultrabooks listed in our database here. Touch, WiDi and arrray-microphones in latest (4th Gen Core, Haswell, mid 2013) models. Thin design and light weight is a core element of Ultrabooks and potentially the only visible indication of a different type of notebook. Higher-quality finishing and sealed batteries will also indicate Ultrabook specifications but there are a number of internal features that will also be included to enable the ‘experience.’ Intel isn’t saying what features are compulsory but we’re able to have a good guess at the late 2011 minimum feature list and we’ve indicated that in the list. We will update this if we find any changes. Rapid Start enables Ultrabooks to resume from hibernate and connect to the internet in sub 7 second times. Rapid Start technology (or other technologies that provide a quick start solution) is a requirement for all Ultrabooks. Smart Connect will wake-up a laptop regularly on a user-configured schedule to check for updates. E.g. Twitter, email, calendar sync. Not much detail is available on these features at the moment. This technology is optional for Ultrabooks. Smart Response Technology – SSD-like performance from hard drives. (Hybrid hard drives with small embedded SSDs.) 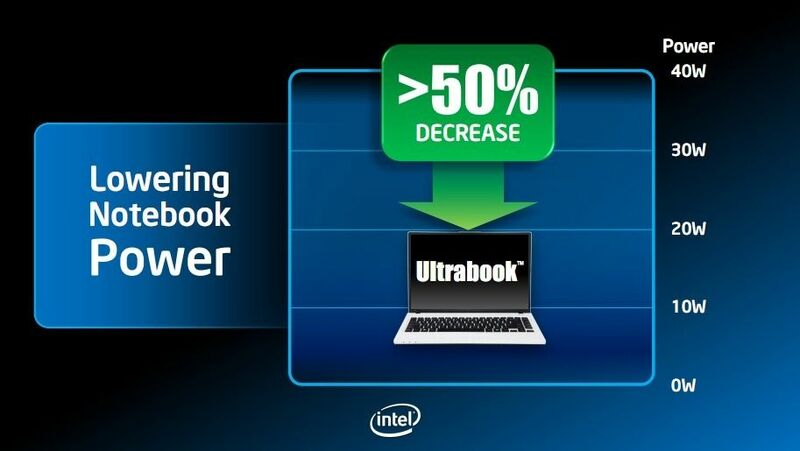 All Ultrabooks will either use all-SSD configurations or the Smart Response technology to enable quick application start-up times. 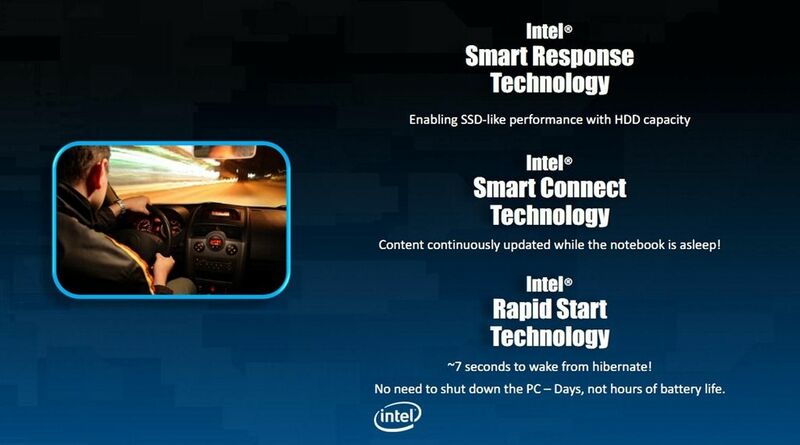 The Smart Response Technology will not be exclusive to Ultrabooks. Connected Standby – An always-on feature of Windows 8 and some new (late 2013) Ultrabooks. Identify Protection Technology – Not exclusive to Ultrabooks, IPT will link the PC to an online account as a second-stage authorisation mechanism. This works through a software and hardware solution with IPT-enabled websites. Two-stage authorisation is also available when not using the IPT-enabled laptop through the use of extra security questions or through the sending of a code via SMS. IPT is an option Ultrabooks. More information here. Anti-Theft – Detects suspicious activity or lack of ‘check-in’ or accepts theft notification messages send over the Internet. Can lock a PC and disable data access and offers the ability for a user to easily re-enable the device if recovered. Hard drive is non-removable. System can be restored by owner. Finally a ‘Good Samaritan’ message can be enabled on the device to alert someone that the device is lost or stolen. This is optional for Ultrabooks. More information here. 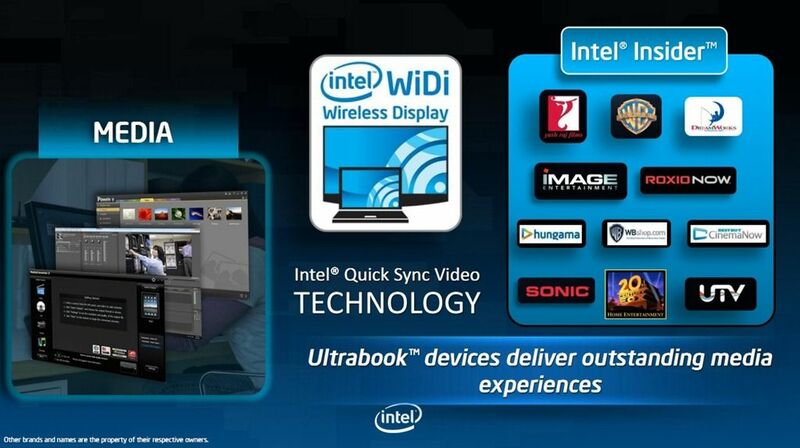 Intel Insider technology provides a trusted, encrypted path for the delivery of high-value HD video content. Mainly for film sales and rental. More information here. Not exclusive to Ultrabooks but available on all 2nd and 3rd generation Core notebooks including all Ultrabooks. Intel Wireless Display. Aka Wi-Di and Wireless Audio. Using Intel-specified wireless chipsets the Ultrabook is able to wirelessly transmit up to 1080p content to a 3rd-party receiver box connected to an A/V system. Not exclusive to Ultrabooks. More information here. Sealed batteries for higher capacity in a given size. This is a design recommendation for all Ultrabooks in order to achieve thin Ultrabooks but some models may offer removable batteries. Low standby drain via highly integrated design. Again, a requirement of Ultrabooks to keep keep the component area small. Always-on features for long, always updated operation. In phase-1 Ultrabooks (2011 launch): 2nd Generation Core processors known as ‘Sandy Bridge.’ More information (PDF) In 2012: the latest Ultrabooks will use the 3rd generation of the Intel Core architecture codenamed Sandy Bridge. In 2013, 4th-Gen Core propcessors known as Haswell. Turbo. Core i5 and i7 processors offer thermal monitoring to allow the CPU to overclock until the system reaches a thermal limit that cuts the CPU speed back down again. 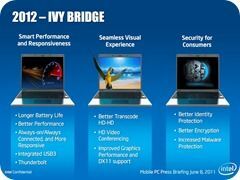 Some Ultrabooks will come with Core i3 processors that do not have this feature. Gaming. Intel HD Graphics 4000/5000/Iris enables casual gaming capabilities using on-chip GPU. More information here, and here. Classic Ultrabooks take the laptop from factor. Hybrids offer detachable screens for tablet-only use. Convertibles offer screens that rotate or fold to flat and allow tablet usage. Entry level pricing for Ultrabooks is currently about $450. Ultrabook models range up to very high end! Mcafee in hardware. 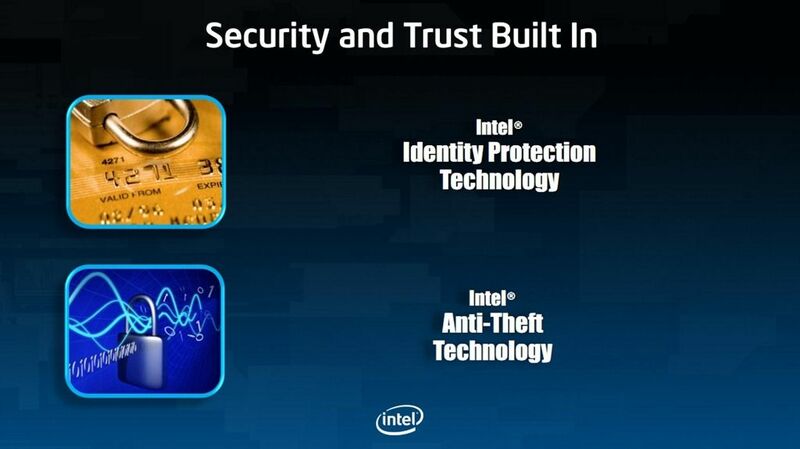 According to the Intel slide on the right, there will be increased malware protection included in Ivy Bridge. This could be the first step at integrating McAfee technologies into silicon. Thunderbolt, the dual 10Gbps communications interface, is likely to be integrated, along with USB 3.0 in the Ivy Bridge platforms. More information here. 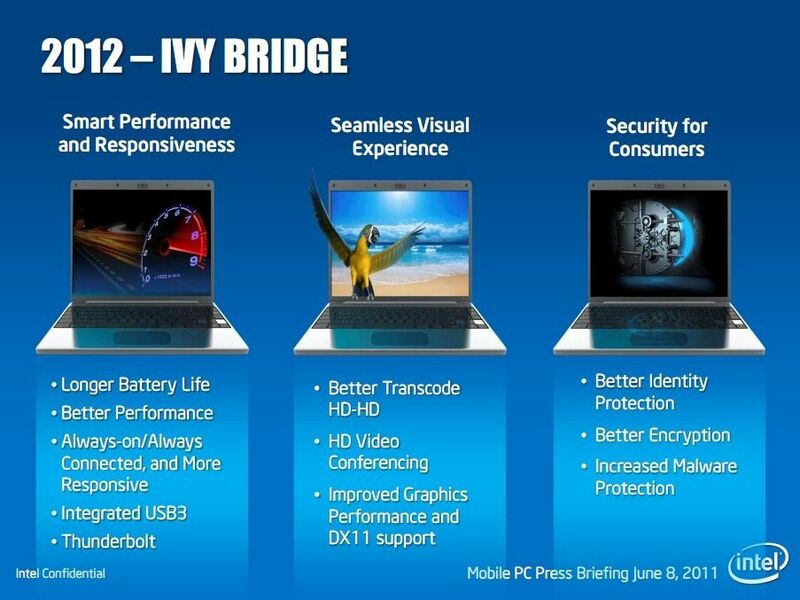 2012 Ultrabooks will all have USB3 ports and some will offer Thundarbolt. WiGiG is a feature of some Ultrabooks in 2013. Intel is investing $300M into new technologies via their Intel Capital fund.